This week and next I’ll be sharing the results from the ski resort social media marketing survey. I had originally planned to just do a couple posts, but man, there’s some really interesting stuff in here. Let’s follow up on Facebook from yesterday with Instagram. Once again, I’ll start by rolling through the results (with a touch of commentary) and then share each of your individual responses after that. The consensus I was expecting yesterday? Found. 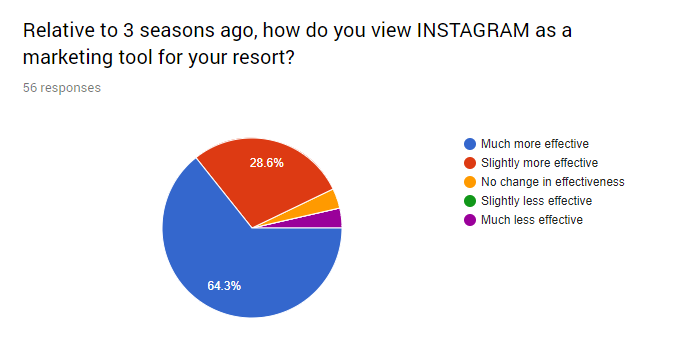 Of the 56 resort marketers surveyed, 93% said Instagram is either “slightly” or “much” more effective today than it was three years ago. Only two respondents said it was less effective now versus then, with two others seeing no change. Nearly 29% of marketers said Facebook’s value was solely in paid, but only a single person said the same for Instagram. Instead, an incredible 46% said the main value came from the free, organic reach with the other 52% using a combination of the two. I was expecting a more distributed spread than this, instead, 3/4 of resort marketers said the simple, the original, the easy single-photo was still their bread and butter. Videos came in second with 14%. Note: The purple slice was an “other” response. 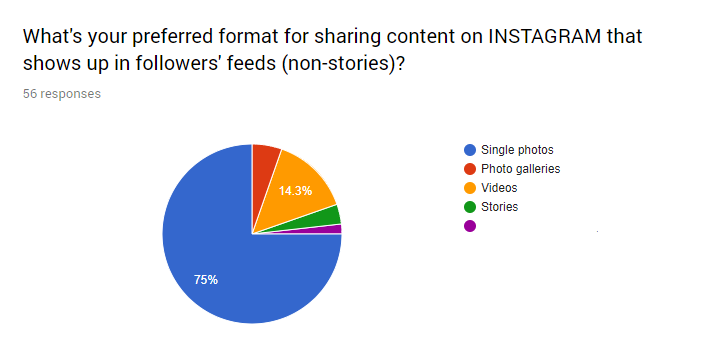 Maybe slightly higher than I expected, but even though single photos are still the preferred format, a TON of resorts are using stories. Show me all the pretty things! Mostly a stoke builder for us. Reaches our younger guests which make up the smallest group. Instagram is more effective organically, but users can see right through when you’re trying to sell to them. They appreciate the organic brand awareness way more than you selling them on an off-season festival that they aren’t interested in. Instagram is a leader in expanding brand awareness yet is poor for converting users to future purchasers for our resort. Wish their analytics were better! A great tool that reaches a younger market. Stories are where it’s at – highly viewed – we strive to keep the content creative with high doses of brand awareness. It’s a great story telling platform. It seems to be a necessary evil from an advertising standpoint. We don’t see as many sales coming from Insta as we do Facebook but it’s still an important one to be advertising on due to the amount of views ads can get. Loving every minute – except not being able to post from desktop…c’mon people, this is the 21st century! My favorite platform, I am working on inspiring the social team to really get into Stories this season and to continue this into the offseason. Instagram has the broadest reach of all the social channels we utilize. It is still about overall brand for us with IG. It’s great for our products as it’s very visual and less about information or selling, plus our millennial audience is very active on insta. Currently the best platform for us, but we expect it to follow Facebook’s path and become less relevant. Oh god the story expired, time to go get another one. It’s easy for our brand to connect with consumers, mostly organically, but it’s great for branding and timely content. We haven’t done much with direct sales pieces and measuring ROI. Stories are perfect for the ski industry, bring your Snow Report to where people are spending their time. Instagram has been great for reaching millennials. It works well for our skiing and summer/fall weddings. It’s a way for people to see how awesome this place is. We’re starting to use Instagram more than Facebook and just a year ago it was the other way around. 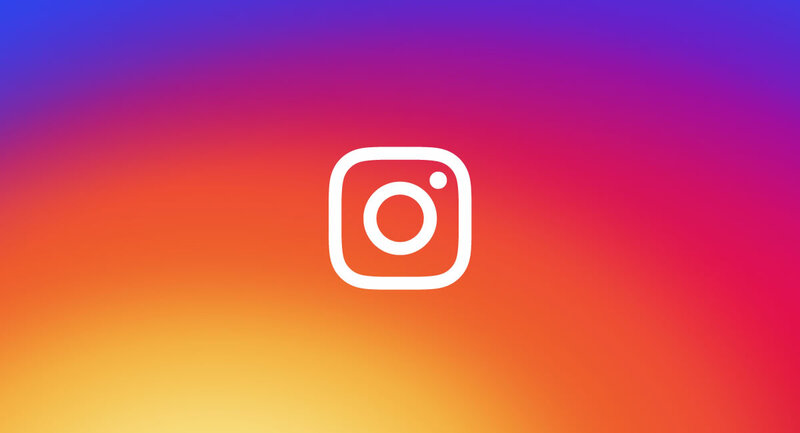 Instagram is peaking right now – it’s personally my favorite social media platform and is incredibly powerful, especially with added features on stories and the advertising capabilities. Instagram stories as paid media is fire right now. Keep it beautiful and simple. It’s a priority and works well for us. If you’re looking to target the younger market this is perfect, but there parents are on facebook. A decided upbeat recap with lots of people talking about stories. Okay, that’s it for Instagram. Tomorrow? Twitter.